JHome is a preventative primary care program for elderly homebound patients established at the Johns Hopkins Bayview Hospital in Baltimore, MD. The program seeks to keep patients out of the emergency room, saving strain for themselves, their families and the hospital system. Dr. Mattan Schuchman is the gerontologist who leads this organization, serving as the primary care physician for patients throughout Baltimore. How might we help Johns Hopkins Home-Based Medicine find and retain elderly homebound patients in the Baltimore area? Integrate JHOME referral services with Meals on Wheels as a partner organization and develop an online portal to make virtual searches more simple. 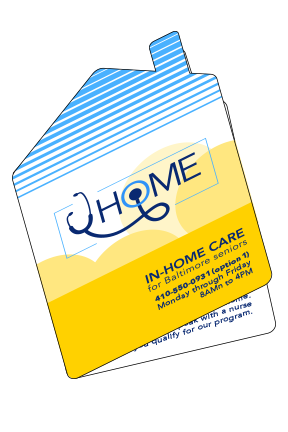 Johns Hopkins Home-Based Medicine (JHOME) is a program for elderly homebound patients in the area codes surrounding the Johns Hopkins Bayview Hospital in Baltimore, MD. Patients enrolled in the program receive regular check-ups in their home by physicians and other health care professionals. Dr. Mattan Schuchman is the gerontologist who leads this organization, serving as the primary care physician for patients throughout Baltimore. The JHOME program, which provides preventative care to elderly Medicare patients who can no longer leave their homes, has been in operation since the 1970s and relies on grants to provide services. They currently serve approximately 180 patients in the Baltimore area, but have a capacity to serve up to 250. The JHOME team reported that referrals to the program were inconsistent -- referrals came through only a few streams, and often for patients unqualified for the program. Our team of students met Dr. Shuchman through Laurie Churchman's Collaboration course at MICA, who tasked us with the challenge of helping JHOME maintain a high level of patient enrollment. The Census Bureau reports that those aged 65 and older grew as a demographic by 3% in the last 15 years, signaling a greater demand for services such as JHOME. Approximately 5% of the elderly Medicare population is homebound, according to the National Health and Aging Trends Study. Through our calculation, we determined that there were about 1,100 potentially qualified patients in Baltimore that JHOME could serve. 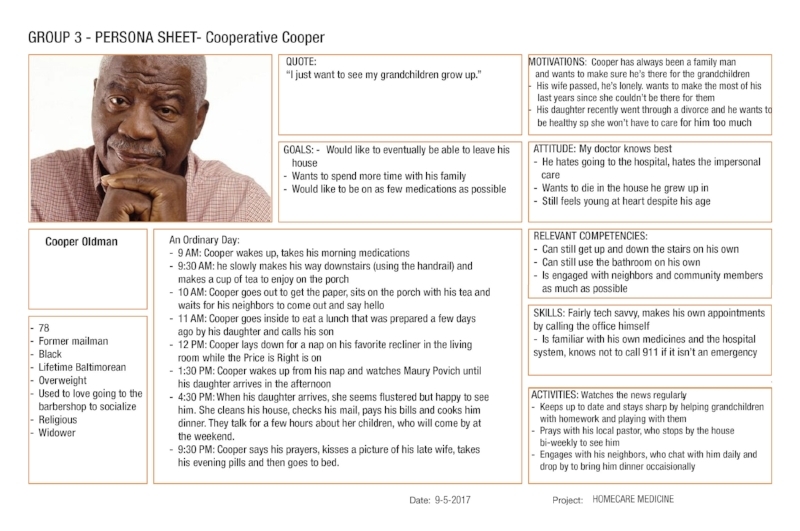 After conducting a series of interviews with elderly patients utilizing other healthcare services, anesthesiologists, nurses, and ER doctors, we developed personas to determine how best to seek out potential patients. Through our research, our team found that Meals on Wheels (MoW) of Baltimore serves the same population of elderly homebound patients, albeit with greater success in enrollment. After visiting the Baltimore headquarters and interviewing the organization's director, my teammate Maren Munoz discovered that Meals on Wheels serves more than 500 individuals across Baltimore, providing them with meals and weekly interactions with drivers trained in elder care. We also discovered that JHOME often referred patients to Meals on Wheels, but never received referrals for their program in return. In addition to our secondary research, I was personally able to conduct ethnographic research on a home visit with Dr. Schuchman. We visited two patients over the course of the morning, allowing to observe the care and interview caregivers. Through these observations, it became clear to me that many caregivers of homebound patients become homebound by extension. To create a truly empathetic, user-centric solution, my team decided to iterate on a suite of solutions that could meet the needs of the JHOME team, patients, and those who care for them. We created a sticker that could be placed on top of Meals on Wheels meals being delivered throughout the city. Qualified patients could be asked by trained Meals on Wheels drivers if they are interested in learning more about the home-based care program. If so, the patient can simply mark "yes" on the sticker, and then the top can be torn off and placed into a box that will be delivered to JHOME staff. The inside of the sticker provides the patient with more information about services provided. In addition to the branded sticker, our team also created a website mock-up that could be used by caregivers to refer patients to the program and make it easier for them to find the services on their own. We presented our findings to Dr. Schuchman and JHOME Administrator Grace Goodhew in October 2017.